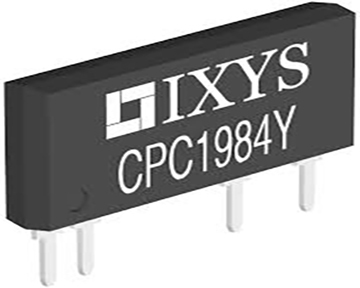 IXYS Integrated Circuits Division, now part of Littelfuse, Inc., introduced the CPC1984Y, a 600V, Normally Open Power SIP Relay, rated for up to 1A DC/1Arms continuous load current, twice the load current of the company’s most popular power relay. This high-reliability device uses optically coupled MOSFET technology to provide 4000Vrms of input-to-output isolation. In fact, the CPC1984Y SIP Relay offers the best combination of load voltage and load current available with a 4000Vrms isolation voltage. The optically coupled outputs, which employ IXYS ICD’s patented OptoMOS architecture, are controlled by a highly efficient infrared LED. LED, provides the CPC1984Y with 4000Vrms of input to output isolation. The combination of low on-resistance and high load current handling capability makes this relay ideal for a variety of high performance switching applications.